Before her arrival on the West Coast, Pauline Johnson had acquired notoriety as a poet and performer and as an active proponent of Mohawk culture. That she was drawn to local legends was a natural extension of an already prolific career as a writer and stage performer. Retiring from the stage when she reached Vancouver in 1909, it was only right that she continues to share her stories. These were first published separately in a local newspaper and later published in book form. 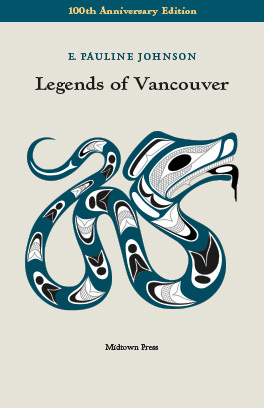 Johnson’s book of native legends quickly became a classic of Vancouver’s literature. We can still detect to this day the joy of discovery that Johnson imprinted in her writing of the legends. Whether just arrived or long-time residents, readers will share with Johnson emotions of discovery when seized, through her writings, by the beauty of the surroundings, just as she was 100 years ago. This book is also a portrait of a very young Vancouver with its much loved Stanley Park, its rough-and-tumble gold diggers and its millennium old First Nations. This 100th anniversary edition combines a mix of archival pictures of Vancouver and photographs by Anne-Marie Comte to provide a sense of where these legends took place and how they are incorporated in the modern city. Disponible en français aux Presses de Bras-d’Apic. An interactive map of Johnson’s Vancouver can be found here.